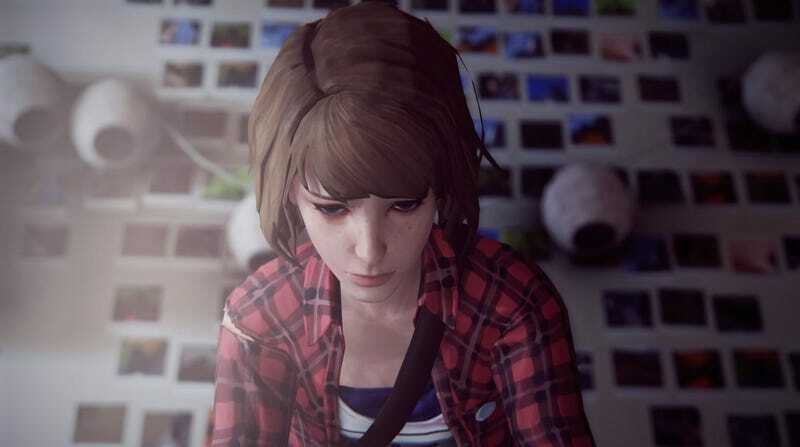 Things get pretty messed up the closing chapter of the Life is Strange saga. At times, Polarized can even feel like a straight-up horror game—which is new! Some episode 5 spoilers follow. From the get-go, things get disturbing in episode 5. Max is captured by Mr. Jefferson, she’s drugged, she needs to find a way out. So Max does what she always does: she rewinds time. Over and over again, she redoes choices she’s made in the past, all in the hopes of getting out alive and fixing things. And for a second, it almost seems like she succeeds in saving Chloe and Arcadia Bay. That’s when everything starts to break down. This hilarity is followed-up by a bit where Max becomes trapped in her own dorm room. Nearly every door she tries leads back to the start of the hallway. It’s a segment that seems to take a page from P.T....only there are no fetus babies in a sink here, I’m sad to report. Yeeeeeah. Like I said: the entire thing is completely off the rails. Everything isn’t executed perfectly—the sneaking section is a real chore to play through—but the nightmare sections of episode 5 are still a potent exploration of Max’s insecurities and fears. It’s all going down as one of the most memorable sections of Life is Strange thus far, at least for me. And for those of you that are chomping at the bit, hoping to talk in detail about the episode as a whole: we’ll have a more in-depth exploration of the ending later this week, when more people have had a chance to play it. I have a feeling this episode will be...very divisive.